Near the Valley of the Kings in Egypt, at the tomb of Neferhotep, a high-ranking official and senior scribe, thousands of years of soot and pollution blackened the wall paintings, hieroglyphs and reliefs at this site beyond recognition. Uncovering these culturally significant works of art is a painstaking process. Even hand cleaning can prove unsuitable due to the fragile wall surface. This work requires highly skilled and knowledgeable conservationist. They must use extreme care to remove soil built-up over the millennia while preserving the delicate underlying paint and limestone surface. In a project supported by the Gerda Henkel Foundation, three conservators from Cologne, Susanne Brinkmann, Birte Graue and Christina Verbeek, tested various methods for cleaning these challenging surfaces. Their work was done in collaboration with other conservationists, scientists, and Egyptologists. 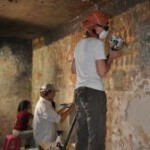 The result- they choose the latest technology to preserve the artwork in this ancient tomb. Here, for the first time ever, the use of laser cleaning was permitted by the Egyptian Supreme Council of Antiquities. Laser cleaning is a non-contact media-free process that proved particularly successful for removing firmly attached dirt and soot from fragile surfaces. These unique features enabled the conservation team to pioneering a new cleaning method using a portable handheld laser system. 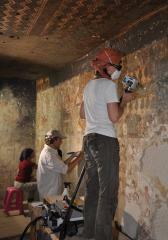 Now, after more than 3000 years, the ornate wall paintings in this ancient tomb can be seen again thanks to skilled conservationist and cleanLASER technology, Neferhotep’s burial site is the largest private tomb in the Theban Necropolis, which consists of approximately 800 graves of magistrates and priests. Further information and video of this project can be found here.